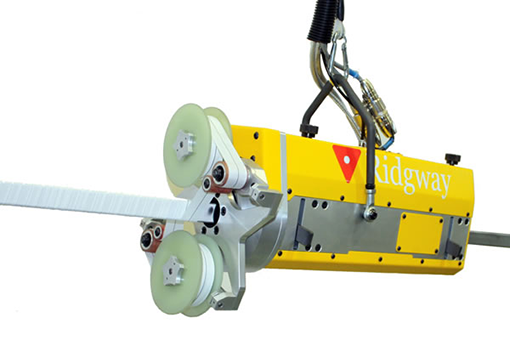 Ridgway Machines manufactures a full range of Coil Manufacturing Equipment, including Rotor Winders, Loop Winders and ancillary equipment such as Capstan Tension Units, Winding Beams and Drum Stands. Manufactured to high specifications and incorporate the latest safety features and fully programmable operator control. Ridgway Machines also manufactures a range of Coil Pull-Out Machines. Easy to operate control panel for the adjustment of loop length, winding speed and individual conductor tensions. Other functions include the ability to set and count the number of turns per coil and the quantity of coils per set. Coil winding details can also be stored within the control system for future use. This automated winding line produces large conventional coil loops. Capable of accepting multiple conductors which are passed through gathering boxes and conductor guidance systems, the correctly orientated and bunched conductors are either taped by the ‘Squirrel’ Tape Turner or guided directly into the loop winding beam. The loop winder has servo driven, adjustable pins which are automatically set to pre-programmed positions to produce a range of variable loop lengths. between the gathering box and loop winding beam during the loop winding process. For a versatile and cost effective solution, the STT Squirrel turn taping machine offers a simple solution to dramatically reduce the overall coil manufacturing time. By introducing the STT between the gathering box and loop winding machine, groups of conductors can be quickly and accurately taped together with minimal disruption to the winding process. The squirrel taping machine is freely suspended on a tool balancer from its own gantry. Variable tape pitch is achieved by setting the rotational speed and linear speed accordingly. The machine is driven by twin caterpillar belts, powered by two synchronised servo motors. Gantries are sized and manufactured to match exact requirements. To ensure consistent adhesion to the conductor, the machine is fitted with a pneumatic traction control system. 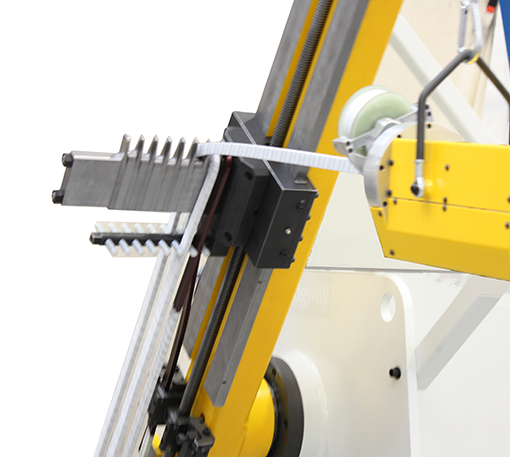 Electrically driven taping machine combining a rotating taping head fitted with a pair of tape applicators. Settings are variable and easily adjusted by the operator if required. Operation is via a control panel mounted on a pedestal. Rotational and linear speeds are adjusted via potentiometers. For a versatile and cost effective solution to suit your loop winding requirements. Sturdy construction, free standing control panel and digital turns counter are key features of our loop winding solutions. The loop winding machine offers quick and accurate set up, vector motor drive, anti runback and easy to operate control panel. Designed for the automated production of complex coils, from on edge field coils to wind turbine stator coils. Improve production effectiveness by utilizing the Ridgway W-MAW. Incorporating a programmable multi-axis winding machine with active drum tensioning and conductor guidance systems, the equipment ensures fast, consistent and high quality production of complex shaped stator coils. Automatic winding without the need for operator intervention. For a complete solution to enable the fast and effective winding of rotor pole coils. The W-RHD incorporates the latest servo drive technology. A variable speed geared motor directly drives the main spindle, providing a high torque capability throughout the speed range. The spindle is fitted with a pneumatic holding brake to ensure a positive stop. The main control panel used to vary speed and direction of rotation is mounted on a free standing pedestal giving greater operator flexibility. The operator has full control of both the acceleration and deceleration through the entire speed range simply by using the remote foot pedal. A range of single and double friction braked or wear free active tensioned drum stands is available. For optimum conductor control a range of pneumatically actuated single or double capstan tension units is available. Rotor support tooling available, featuring indexing clamps, enabling easy repositioning of the rotor between winding cycles. Providing you with greater flexibility, a large faceplate is fitted as standard to enable easy direct fitting of existing tooling. Exclusive tooling/fixture design can also be incorporated offering you a complete solution. Ridgway Machines manufactures a range of Coil Pull-Out and Coil Forming Machines. The POM-STD range of coil forming machines are used to spread coils quickly, accurately and efficiently into their final shape according to the individual coil design requirements. Offering a cost effective and versatile solution, the machines are fully adjustable and simple to operate. The POM5000 large hydraulic coil forming machine is used to pull-out stator coils into their final shape according to the individual coil design requirements. The machine has the power to shape coils of the largest cross section and the flexibility to be adapted for different bend radius at the nose and in the core bend region. For a versatile and cost effective solution the POM-WPB wind and pull-out beam offers a simple production solution to dramatically reduce the overall coil manufacturing time. The POM-WPB enables phase groups of single and multi-turn coils to be loop wound and pulled-out in one operation. The POM-CC servo driven coil forming machine is used to simultaneously form single and multi-turn coils in phase groups of up to eight coils. Enabling the fast and effective winding of stators, this turn-key production solution dramatically reduces the number of winding connections required. Simple to operate, production efficiencies of 50% can easily be achieved. The HCP Hot Coil Compaction Press is designed to heat and consolidate straight loop stator coils, each machine tailored to the customer’s specific needs. The HCP incorporates a set of hydraulic rams built into hinged arm assemblies across the top length and rear face of the working envelope, with independent hydraulic circuits. Each ram can deliver 10 tonnes of force and the number of rams can be selected to suit specific coil lengths. Coil heating is achieved using a set of electrically heated platens (heater bars) at the front and rear sides of the machine. Each platen is independently operated/controlled from a freestanding HMI cabinet. After pressure is applied, the platen temperature is raised to a set point and held for a period of time (soak time). The platens are then cooled with an air blast followed by recyclable cooling water prior to hydraulic ram release and unloading of the coils. The HCP Hot Coil Compaction Press is designed and assembled by experienced Ridgway engineers using high quality, robust components. This ensures that a uniform and precision compaction process is reliably achieved for a wide range of coil consolidation requirements and long term operational life. Full HMI operator control is provided from a freestanding cabinet. This covers the entire compaction process from hydraulic, air and temperature control to cooling and power consumption for each of the control zones within the machine, including fault diagnosis.